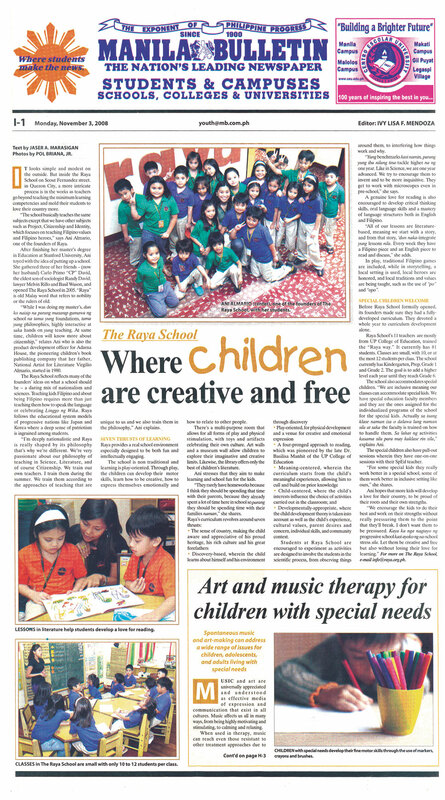 The Raya School is a progressive school dedicated to helping your children discover themselves, their roots and the world around them. The name ‘raya’ comes from the Malay word ‘rajah,’ which connotes nobility. The Raya Preschool curriculum covers themes and topics relevant to the child’s life. Through these themes and topics, the child develops and eventually masters competencies in Math, Science, English, Filipino and the Arts. Singapore Math is the approach used in teaching the children numeracy skills. Knowing the value of their family and community are integral to the development of the Raya preschoolers. The preschoolers go on a lot of exposure trips as well as meet many resource people and Raya parents who visit the school to share their talents, knowledge and expertise. Both the Raya Preschool and the Raya Elementary utilize the Project Approach, developed by Dr. Sylvia Chard of the University of Alberta. Through this approach, students are engaged in many investigatory projects throughout the schoolyear that will make use of their newly learned skills in the different subjects, increase their knowledge of how things work, as well as provide opportunities to practice scientific thinking. Students are assessed trimestrally, using both traditional and alternative assessment tools. The medium of instruction in all preschool classrooms is bilingual. Raya Elementary students experience an integrated curriculum, that is informed not only by the themes above, but also their own interests, skills and inclinations. Following an integrated curriculum, our elementary students explore lessons in all traditional subjects, as well as more advanced activities and lesson in Science, Citizenship and Identity. Singapore Math is the approach used in teaching the children numeracy skills. They are also exposed to varied forms of literature. Students are assessed quarterly, using both traditional and alternative assessment tools. The medium of instruction in all elementary classrooms is bilingual. It’s National Children’s Book Day (NCBD) Celebration and students come to school wearing a costume of their favorite book character. Raya Junior High is a natural progression from Raya Elementary. Teaching across the curriculum is done in a progressive manner: learning is experiential, collaborative and engaging. Aside from the subjects mandated by DepEd, the Raya Junior High Curriculum includes Design Thinking as well as Pagkamamamayan at Pagkakakilanlan (Citizenship and Identity). There is also a day devoted to Integration. During Integration Day, the students spend a whole day doing activities and projects that integrate the knowledge and skills that they have learned across the curriculum. Integration Day may also have them meeting experts in different fields to guide them through their current interests. The goal of Raya High is to produce graduates who are Innovators, Entrepreneurs, Reformers and proud Filipinos.